My friends and I have set forth on a journey to democratise creativity. 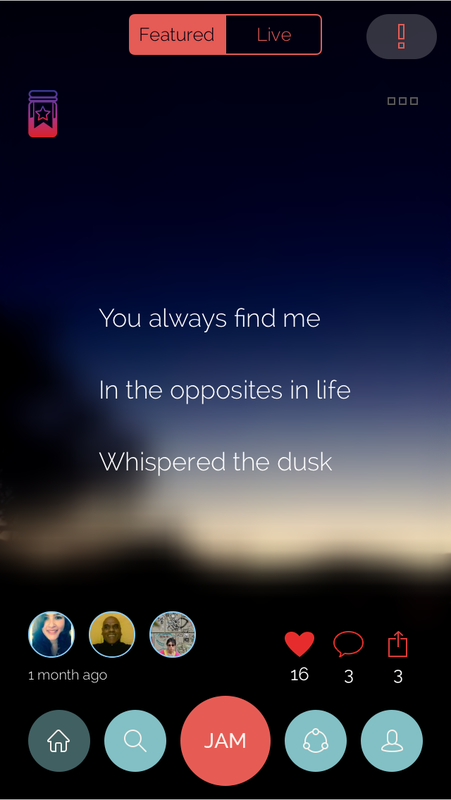 We founded HaikuJAM, a mobile app through which three people connect to create poetic expressions together (available for free on iOS and Android). With words and photos, folks can “jam” with friends or strangers, anywhere in the world. The framework is inspired by the ancient Japanese art of haiku. Through a method of co-creation, we want to facilitate genuine human interaction and derive meaning from moments, which would otherwise be lost to time or dismissed as ‘fleeting’. The collaborative process involves three jammers and each contributes a line or photograph, turn-by-turn-by-turn. Jammers can then share the created content through social media and also earn Karma points for doing good in the community- ‘good’ deeds include loving jams, writing positive comments and a host of other hallowed acts! Each day, our team handpicks a number of inspiring collaborations, which are then featured on the app’s Home Screen. The design of HaikuJAM is often described as ‘Zen’ and ‘elegant’- I actually practice meditation daily and I’m very much inspired by the concepts of stillness and channeling energy around the body. Such ideas have definitely played a role in the evolution of HaikuJAM’s aesthetic and user experience: the process of consuming content is still and deeply immersive, with beautiful full screen photographs and crisp typography. However, the underlying content creation mechanic is radically collaborative and dynamic. Before officially launching the app in March 2015, our hypothesis was that HaikuJAM would be a space for time-poor, creatively inclined people, to engage in creative activities. Since launch however, fascinating use cases have emerged: a few people shared with us in confidence, that they were suffering from clinical depression- for them, HaikuJAM was a place for self-expression, and they saw the community as a support network, not just a group of content creators and consumers. Some jammers, especially in East Asia, have been using the app to improve their written English and vocabulary. A significant number of users are in fact working professionals, from Investment Bankers to Doctors, who view HaikuJAM as a tool for stress-relief, escapism and reflection. Since March, we’ve featured in Forbes, The New York Times, BBC, TechCrunch, CNET, YourStory and we were selected amongst the “50 BEST CREATIVE APPS” globally by The Guardian. The average active user spends up to 30 minutes in the app everyday, and nearly 50% of active users are also creating content. This year, we graduated from the Oxygen Accelerator Programme at Google Campus London, and raised seed funding from the lead investors in JustGiving. My co-founder, Neer Sharma, and I are currently in San Francisco meeting product mentors, investors and other incredible people working in technology. So we’re off to a good start, but the road ahead is long and we have a lot to learn. For instance, a few weeks ago, in the process of ramping up our servers, we accidentally erased a portion of the database- we lost fourteen days worth of content created in the app. This was disastrous. Determined to make the best out of an otherwise sad situation, with the support of the wonderful HaikuJAM community, we recovered some of the lost jams from the period and curated a free eBook titled “The Lost Weeks”. Other than the typical startup struggles around fundraising and traction, one of our biggest challenges is: how do we ‘focus’ the value proposition considering the multitude of use cases, or can they simply co-exist without detracting from the product’s core appeal? After reading “Hatching Twitter” by Nick Bilton, it seemed that the Twitter founders also struggled with this (albeit on a much grander scale), as Twitter became a proverbial Wild West with curiously nebulous sets of people and activities. The manner in which we leverage data, coupled with our own decision-making, will ultimately determine the future of HaikuJAM as a platform. Moving forward this year, we are going to further contextualise the creative experience through campaigns for brands, charities and around trending news events. We also want to curate the fantastic content in the form of monthly book subscriptions and artistic merchandise. Furthermore, we aim to introduce new mediums into the app, such as sound and video. Our vision is rooted in collaborative creativity, aka “The JAM”. We care deeply about connecting humans to make beauty happen… Down the rabbit hole we go.